I was out of town a few weeks back and stopped by a Home Depot to pick up a quart of ultra just to try ( nearest Home Depot is 100 miles or so) and while I loved the leveling, adhesion was nowhere near what I thought seeing the posts on here. I thought I got a fluke. I started using Ultra Premium Plus on my last three houses and have had adhesion issues where yellow frog tape made for delicate surfaces pulled off 2 coats of Ultra Premium Plus that had been rolled with a nour 18" aqua glide roller sleeve. Paint had been left to cure for 8-10 days before applying the tape. Spent 2 days patching and touching up to fix. So in my 30 years of painting it is just another paint gone bad. Cashmere is okay it has great things about it Mike that even Jack has mentioned before. It doesn't measure up in alot of other areas and I would still use plus or ultra over it (maybe test are required). Personally I do like Cashmere but don't find it very durable/as scrubable. That maybe an opinion. Don't get me wrong though that is still my favorite Sherwin product. Let's roll the new breakthrough on everything! Haha jk. Best to view this photo from a browser or save it to your phone to zoom.  I left the image size large. So, I am sure Behr would appreciate this, how is it possible that problems occur on common building materials? Why is adhesion an issue? Is it the method of testing (industry standards)? It's like I always say, you can't ask just any painter about paint performance. How poor adhesion results ever make it past phase one of testing is incomprehensible to me. I was going from one thought to another. Your whole system was dependent on the Paint, the roller, the roller covers etc. The problem obviously, is that the Paint portion of your system has let You down. I then drew a coparison of another industry relying heavily on something - in this case, a spokes person. And then to validate My comment, I added that I knew from experience how the Ad industry works because I am a part of that Industry. The Video is an Example of My work. That's My voice on the Movie Trailer. Remember, Painting is a relatively new gig for Me. I was a Radio personality for many years as well as a voice talent and Studio owner. It had nothing to do with You being paid by Behr. As I've said in the past, that makes no sense at all, since you have trashed one of the Behr products (Marquee). And if that wasn't enough to convince people that you weren't a paid rep for Behr, You have now brought to light some more short comings from the company; this time with your favorite product. Ah.. gotcha. Well I look at it this way. 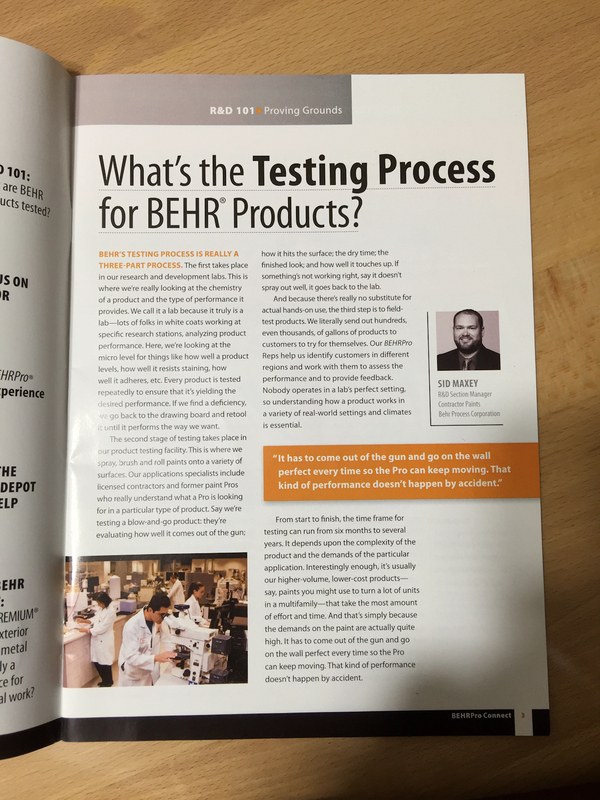 If Behr doesn't want to get my input on product development then they shouldn't be surprised when I have something negative to say. That is all avoidable. When the product hits the store shelves, its too late. More thought... if you align Good, Better and Best to Premium Plus, Ultra and Marquee (as it should be)... I guess they failed to meet "good" on their lineup at this point. Good paint sticks. I would throw this right back in their face and say, "prove it"! Thanks for the input Santiago! I haven't used many of SW's products accept for the Duration. I wan't crazy about their Showcase + Nothing plus about it really! You, Johnny Boy, are but another speed-bump on the Paint Industriy's Highway of life! I wouldn't bother. Sales numbers speak louder. 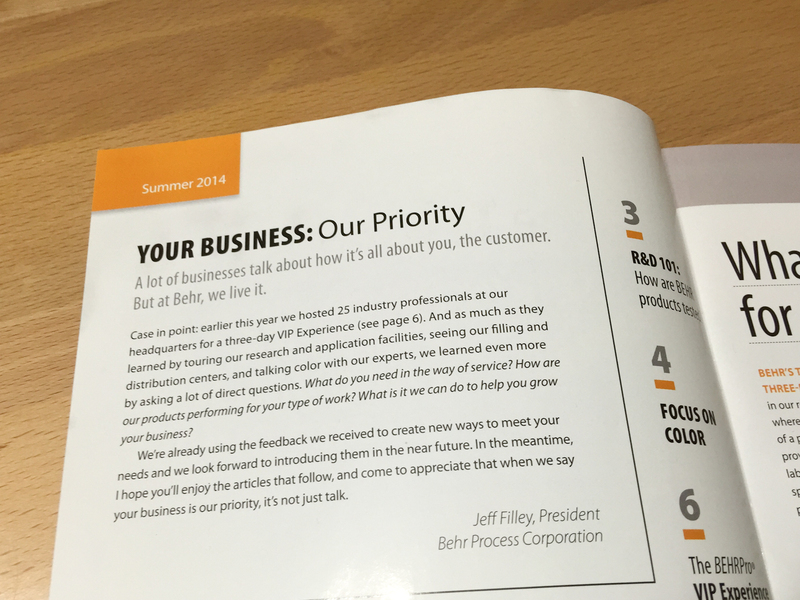 That photo I posted of "Your Business: Our Priority" is mumbo jumbo. That kind of talk means nothing to me; I'm all about action. I was invited to that event but I had way too much on my plate to attend. Besides, that event was more of a 'show and tell' and I'm not interested in that kind of nonsense. I stay pretty focused on things that make my job easier and tend to shy away wasting time on anything else. From the Emerald review April 2013. Stain blocking, excellent leveling, great hide, self priming, etc., is useless if the paint doesn't stick. The paint becomes a cosmetic product where its function is lost in development.